Are bacteria evolving to eat plastic? We drink way too many things that come in plastic bottles and buy too many things that come in hard-to-tear open plastic packages. We only recycle a small amount of that packaging, so it's good news that a team of researchers have discovered a bacteria that is capable of eating plastic. As the researchers note, until now, we only knew of a few species of fungi capable of breaking down Poly(ethylene terephthalate), or PET, which is commonly used to make plastic bottles. PET is one of the toughest and most abundant plastics out there and in 2013 alone some 56 million tons of it were produced worldwide. Finding this new bacteria, which the Japanese researchers named Ideonella sakaiensis 201-F6, was no easy feat. According to their study, published Thursday in the journal Science, the researchers collected 250 samples of PET plastic from a recycling facility, while specifically looking for indications of degradation. These enzymes appear to be highly unique in their function, raising questions of how these plastic-eating bacteria evolved. Dr. Kohei Oda, an author on the study and a biologist at the Kyoto Institute of Technology, told me that they eventually succeeded in isolating a bacterium that could completely degrade PET into carbon dioxide and water in about six weeks. According to Oda, PET is the most difficult plastic to decompose biologically due to its crystal structure and molecular adversity to water, a quality known as hydrophobicity. The two highly unique enzymes used by the bacteria (ISF6_4831 and ISF6_0224) efficiently converted the PET into two environmentally friendly monomers (terephthalic acid and ethylene glycol). According to the researchers, the monomers could be synthesized into PET again, i.e. recycled in the traditional sense, or fermented to produce other useful compounds. Oda said that this research is the beginning of understanding how the bacterium and its enzymes could be used to create a more "nature-friendly" recycling system. Until then, he recommended using bio-degradable plastics instead of PET. Manufacturing PET products also creates significant carbon dioxide emissions, about four metric tons for every one ton produced, thus contributing to climate change. With petroleum products especially cheap right now, the recycling industry has been suffering. However, the researchers believe that once raw petroleum becomes expensive again cheaper recycling technologies, possibly employing aspects of their new research, will thrive. Most plastics degrade extremely slowly, thus constituting a major environmental hazard, especially in the oceans. Dr. Uwe T. Bornscheuer, a German biochemist who wrote an article contextualizing the study's findings, told me that "PET could be turned simply into biomass by growing this bacteria." He said whether this is fast or efficient enough for a real world application remains to be seen. According to his article, around 311 million tons of plastic are produced worldwide every year; with 90% coming from fossil fuel refining. While "a considerable portion" of these plastics are used for packaging—such as with drinking bottles—only around 14% is collected for recycling. As for Americans, we throw away around 33 million tons of plastic every year. "Most plastics degrade extremely slowly, thus constituting a major environmental hazard, especially in the oceans, where microplastics are a matter of major concern," writes Bornscheuer. "One potential solution for this problem is the synthesis of degradable plastics from renewable resources. This approach provides hope for the future but does not help to get rid of the plastics already in the environment." Bornscheuer told me he supports the design of a "green synthesis" of plastics in order to ensure biodegradability after use, and ideally, reuse in new products. With certain caveats. "You should also keep in mind that for some plastics, we don’t wish rapid degradation," he said. "I.e. the plastic frame of your office window should not be degraded while you have it in your house." The PET bottle was patented in 1973, just over 40 years ago, and recycling programs were implemented shortly thereafter. PET is not only used to make water bottles, but also other bottles such as for salad dressing and peanut butter. It's also used as a film for oven trays and other food trays. According to Waste360, as of 2012, half of all polyester carpet made in the United States came from recycled PET bottles. 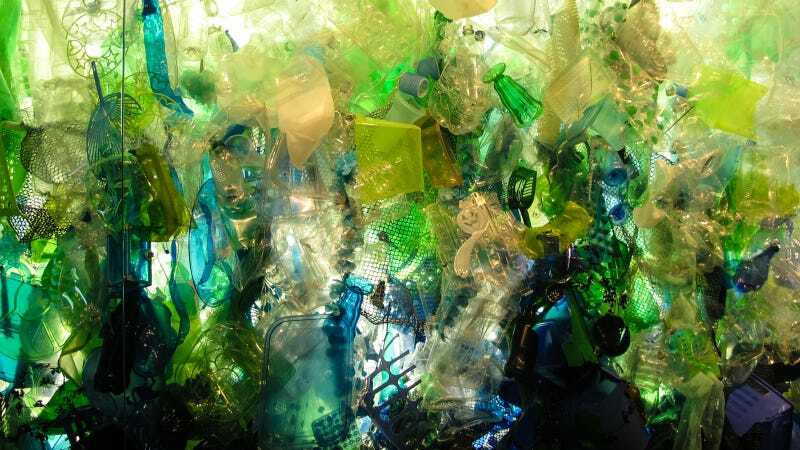 About 17.28 pounds of PET bottles per person are created every year in the United States, with around 30% being recycled. However, according to Waste360, "increased consumption of water and soft drinks away from home along with continued lightweighting of PET bottles has created challenges for increasing the PET recycling rate." Human-made PET has been present in the natural environment for about 70 years. When asked about a recent similar Stanford study that found that mealworms can eat Styrofoam and turn it into something natural within 24 hours, Bornscheuer said that the "gut bacteria in the mealworm are responsible for the degradation." So it all comes back to bacteria. In the case of the mealworms, Bornscheuer said they are not surviving on Styrofoam alone, whereas the bacteria in this new study are able to eat solely PET. Going forward, more research will likely be devoted to the two enzymes that broke down the PET. According to the study, these enzymes appear to be "highly unique in their function compared to the closest related known enzymes of other bacteria, raising questions of how these plastic-eating bacteria evolved." Human-made PET has been present in the natural environment for about 70 years. Did both hydrolytic enzymes evolve during that relatively short period to enable the bacterium to access a novel carbon source and hence provide an advantage for survival? He writes that examples of such rapid evolution are scarce, but not unprecedented. Maybe one day eating plastic will be considered the natural thing to do.